As I was walking through Akihabara, I noticed a crowd in front of Gamers. When I went to see what event was taking place, I saw a familiar face. 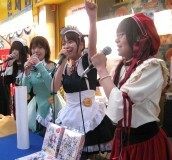 The group Kusakanmuri was holding a signing and handshake event for their CD Ganmen Punch, which was the opening song for the PC game Pia Carrot he Youkoso GP. Kusakanmuri was a group made up of four girls: Kaya, Aoi, Rin, and Gumi. Aoi is Oda Yumiko. The event was held just outside of Gamers, and it was free to watch. Those who bought the CD were able to get it signed by the girls. They also had a janken and gave away posters and other small goods. The girls were wearing various Pia Carrot outfits. Not sure if photos were allowed, but they didn't stop people from taking pictures. Now I always carry my compact camera with me, so I was able to take some photos. Not great, but better than nothing.